Fly fishing vests, sling-packs, backpacks, and even chest packs are one of the conundrums all us fishing folks are faced with at some point in our fishing escapades. The perfect gear bag is out there for everyone, you just have to do some due diligence to find it. Deciding on the right choice comes down to various factors and can make for a difficult decision. In my latest quest to solve this problem I have chosen to go with the new G4 backpack from Simms. 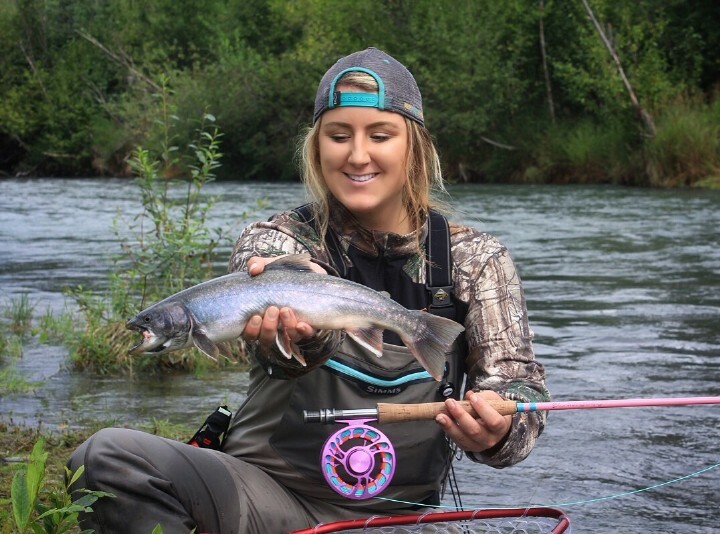 When it comes to fly fishing I tend to venture farther than your typical angler. I put in numerous miles on different shorelines and trails to find the best water that day. For this reason I choose to saddle up with a backpack more often than not so I can carry all the “needed” gear. Of course sometimes I carry a giant streamer box and two Tacky boxes full of flies but end up throwing the same streamer all day if it’s catching fish. Most of the time I bring a large assortment of flies, two rods, one reel with floating line, one reel with sinking line, a net, lots of h20, and of course my favorite snack – elk jerky. 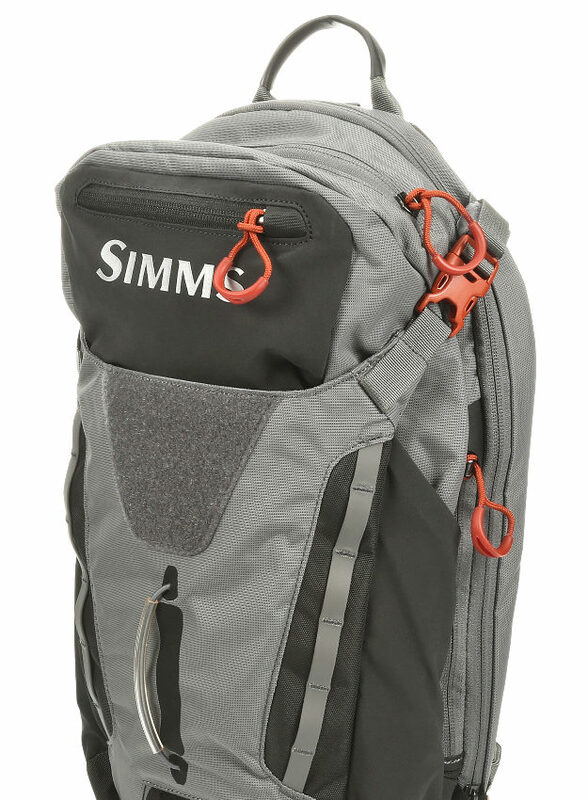 After doing some research I chose to give the Simms G4 backpack a go and it has not disappointed. Initially I had some concerns with the black nylon fabric being insanely hot on a sunny day but I was surprised by the TPU coatings ability to reject any over-heating on the shoreline. On one of my trials with the bag I had placed it on the shoreline rocks for over a couple hours untouched while chucking some flies and was shocked to come back with no regrets or concerns. The bag was no hotter than any other pack with dark colors I’ve placed on the shoreline. I had no issues getting into the pockets and my water bottle wasn’t hot to any warm degree. Not only does the fabric stay cool but it’s durable and super water resistant. The second time I ever used the pack I stood on the shoreline for hours in a down-pour of a storm and none of my gear was wet. Extra gloves and layers stayed dry in the main compartment and all my fly boxes avoiding being soaked by some annoyingly persistent precipitation. One of my favorites features on the G4 backpack is the two fold-down workbenches. The top compartment contains a tippet tender and floatant holder both with Velcro attachment. The lower fold down workbench also has some handy tool and accessories pockets. I’ve been keeping all my tippet, extra leaders, and a straightener in the top compartment. The bottom one has been great for a small sunscreen stick, pliers, and sometimes a small Leatherman. The Velcro on the top attachments is burley and holds plenty of tippet and can be handy while wading both rivers and flats at Utah Lake for example. The backpack features a few different options for carrying other gear like rods, water bottles, and a net. There are rod tube carriers on each side with two straps that also double as water bottle carriers with compression straps. When I’m cruising the shoreline or a flat for carp I have one rod in hand, another geared up or in the tube on the pack, and a net lashed down or clipped to the other straps. Even with another 8WT rod strung up the rod tube carrier still does excellent. I can keep another rod strung up for a different species ready to do work on fish lips. With all the different options its easy to make accommodations whether I’m heading up to a high mountain lake, crushing shoreline, or quietly wading a flat for mud missiles. This backpack is built on an aluminum frame so it maintains a light feel. No matter how much gear I’ve packed into this bag it might feel heavy, but placed on my back there isn’t much of a weighty feeling. The sprung back panel maintains air-flo and keeps you cool no matter your layers and keeps you going even uphill in the high mountains. The waistband is removable but I like to keep it on there to help support the pack while I’m casting larger weight rods or hiking. The nice padded shoulder straps top this bag off carry-comfort wise and I have no problems wearing this bag for extended periods. 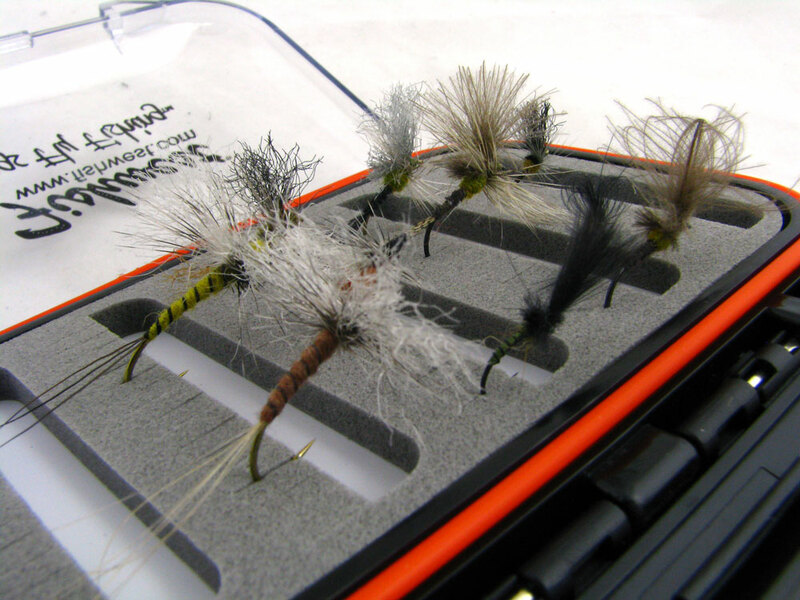 The solution to the fly fishing “gear packing problem” is finding the right choice for you. What I can tell you is; if your style of fishing is trying your best to cover millions of gallons of water every season I suggest you check out the G4 backpack. I also went with this bag for some of the river floating trips I do, it’s not one of those extremely waterproof dry bags, but I can still be confident my gear isn’t going to be soaked through rapids and rip open in the worst case scenario of flipping a boat. My gear will stay dry, strapped to the boat, and I will have everything I need and readily accessible while floating. In the end this bag has treated me great and kept me on the water longer and I will never look back. I can’t wait to continue exploring different places and catching more fish. Thanks for reading and don’t hesitate to reach out. Come in to the Fishwest fly shop to pick up your own Simms pack and give me a follow @cuttypowshark to check out my adventures with the Simms G4 backpack.